Reference number for this case: 11-oct-54-Doncourt. Thank you for including this reference number in any correspondence with me regarding this case. On October 12, 1954, the regional newspapers L'Est Républicain and Le Républicain Lorrain published an identical article on an alleged sighting on October 11, 1954, at "Doncourt-Village", in the Meurthe-et-Moselle department. That Sunday, around 1:30 a.m., when everything was quiet in the countryside around Doncourt-Village, a sizzling noise and an abnormal hiss had awakened the inhabitants of a farm located a few hundred meters from the country. The open shutters let see in the countryside a flat object, projecting a blinding glow, "three times as big as a setting sun", which was placed on the hillside, bordering the wood of Doncourt. After a few moments, the "saucer" rose vertically and disappeared. In the afternoon of October 12, 1954, searches in the vicinity of the place where the "craft" had landed, had revealed in the middle of a dirt road, a few meters from the edge of the forest, a trace of recent burn, of a circumference of about 1.50 meters. The stones of the road, particularly muddy at this place, had burned to a thickness of more than two centimeters, had become red like brick. The earth was reduced to ashes to a depth of three centimeters. No trace of grass or twigs remained in this place. Samples of stones had been taken and "will be delivered to a laboratory to try to find out the degree of heat reached there." These newspapers ensured that the person who saw the machine, and who wished to remain anonymous, "cannot be called a joker or a visionary." A shorter version, by the AFP, then appeared in the national Press. Several newspapers would write "Moncourt" instead of "Doncourt". Neither I nor anyone has found the slightest publication of results of an analysis of soil samples. Jacques Vallée catalogued the case, sometimes writing "Doncourt-Village" and sometimes "Montcourt" for the place. He writes that the samples were taken by "officials" (what web catalogs will later translate as "the police"). Garreau and Lavier indicated in 1974 that they were Gendarmes. In 1979, "skeptical" ufologists Gérard Barthel and Jacques Brucker noted the error of the place name in Le Figaro, copied by Jacques Vallée, and indicate that they contacted the witnesses of this phenomenon and that "generally speaking, their narrative corresponded to that of the Press at the time." In 1997, Jean Sider added that the witnesses were Mrs. Jacques, farmer in Doncourt, and Mr. Félix André, that the object or luminous phenomenon was placed on the hillside on the edge of the wood of Doncourt, emitting sizzling and hissing sounds while diffusing a blinding glow. He indicated that there was an LDLN group investigation, and that Barthel and Brucker's counter-investigation on the case is "imaginary." In 1979, Michel Figuet was the first to give the name of the village as "Doncourt-lès-Longuyons". 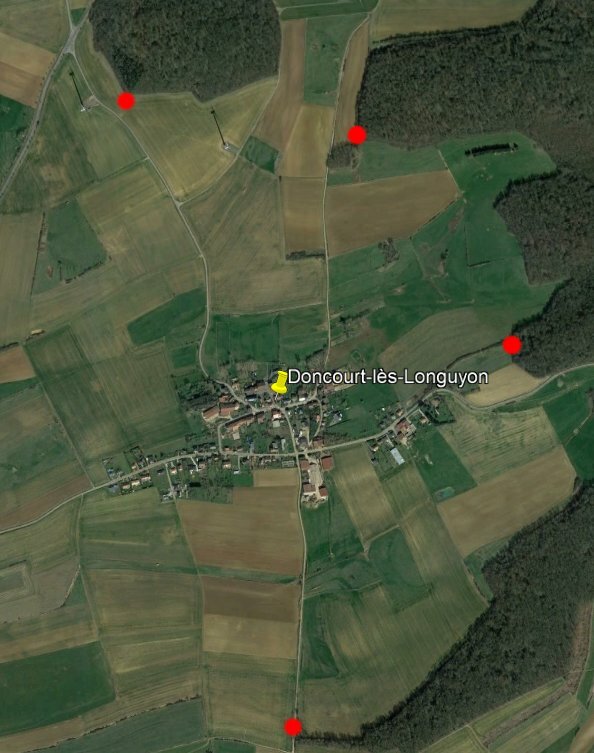 In this file, I explain why the correct village was quite likely: Doncourt-lès-Longuyon. Longwy (from our newsroom). - Here's a new story to list in the saucers file, a story all the more disturbing that the person who saw the machine (and who wishes to remain anonymous), cannot be called a joker, or a visionary. Sunday, around 1:30 a.m., when all was quiet in the countryside of Doncourt-Village (Meurthe et Moselle), a sizzling and abnormal whistling sound woke up the residents a farm located a few hundred meters in the country. The shutters opened, one could see in the country a flat object, throwing a blinding light, "three times as big as the setting sun", which was placed on the hill, near the wood of Doncourt. After a while, the "saucer" rose vertically and disappeared. Research conducted yesterday afternoon near the place where the craft had landed, discovered in middle of a dirt road, a few meters from the edge of the forest, a recently scorched track 1m50 of circumference. The stones of the path, particularly muddy at this place, were burned on a thickness of more than two centimeters, were turned red like bricks. As for the earth, it is burnt down to a depth of three centimeters. No trace of grass or twigs is left at this place. Samples of stone were taken and will be delivered to a laboratory to try to determine the degree of heat reached there. Here is a story to add to the saucers chapter, a puzzling story since the people who saw the machine (and who wishes to remained anonymous), cannot be called a prankster or a daydreamer. Sunday, at about 1:30 A.M., whereas everything was quiet in the country surrounding Doncourt Village, a crisp noise and an anomalous whistling sound woke up the residents of a farm located at some several hundred meters of the country. The opened windows flaps let see in the country a flat object, casting a dazzling light, "three times bigger than the setting sun"; which was landed on the hill, near Doncourt's wood. After a while, the "saucer" rose vertically and disappeared. Searches made yesterday afternoon in the surroundings of the place where the object landed, allowed the discovery, in the middle of a dirt road, at a few meters near the edge of the wood, a recent burn trace, of a diameter of approximately 1 m 50. The stones of the dirt road, particularly muddy at this place, were burnt on a depth of more than two centimeters, and had become red as brick. As for the ground, it was reduced to ashes on a depth of three centimeters. No trace of grass or woods left at this place. Stones were sampled and will be delivered to a laboratory to determine the temperature of the heat at this place. NANCY, October 13 ("France-soir" news brief). - At about 1:30 a.m., yesterday morning, when everything was asleep in Doncourt-Village (the Meurthe-et-Moselle), an abnormal whistling sound awoke the inhabitants of a farm, out in the country. Worried, the farmers went at the window and saw a flat object, "three times as big as a setting sun", they said, posed at the edge of the woods nearby. Soon the object rose with great speed to the vertical and disappeared. At the place indicated by the farmers, the gendarmes found that the stones had been calcined and had taken on a brick-red color on a circumference of 1 m. 50. The earth, everywhere else soaked by rain, was, within this circumference, reduced to ashes on a depth of three centimeters. YAOUNDE (Cameroon), Oct. 12 ("France-soir" news brief). - An enormous illuminated disk was observed Sunday in Yaoundé by a group of trustworty people: Colonel Cauvin, director of the health and prophylaxis services of Cameroon; Dr. Menn, chief medical officer of the hospital; MM. Dumont, Director of the Security Services; Poileux, Councilor of the Territorial Assembly; Moreau, administrator and deputy mayor of Yaoundé. It was the dog of the house who, by barking, attracted the occupants. Under the disc hung a sort of oscillating cylinder. The machine, after a few seconds, disappeared quickly towards the east. AN ORANGE DISC emitting bright lights was observed in Champagne-sur-Seine (the Seine-et-Marne) by M. T ..., a seasonal worker in Machault, who took pictures. A butcher at Seine-Port saw at Savigny-le-Temple a similar machine, as well as in Meaux, Mr. Lefranc, a bank clerk in Paris. AN INCANDESCENT BARREL, two meters high, was seen in a pasture by two young girls from Heimersdorf (Haut-Rhin). The craft rose and disappeared quickly. above Machault a circular craft emitting a fairly bright light, of orange color. The disc, which was about the diameter of a full moon, was moving at relatively slow pace, crossing the sky horizontally. MELUN. -- Mr. Demarchy, butcher in Seine-Port, and one of his friends, who were traveling by car in Nandy, reported seeing a luminous disc flying at an altitude of about 800 meters. The two butchers left their car and followed the evolution of the craft for about a minute. QUIMPER. -- Mr. Correntin Couarch, 58-year-old, resident of the village of Elliant (the Finistère), farm worker, saw in the sky, at 200 meters above sea level, a luminous craft which he can not specify the shape and size. He said that, frightened, he had turned off the lantern of his bicycle to avoid attracting attention and walked away quickly. At one kilometer, he said, he looked back and saw the light stopped at ground level. TOULOUSE. -- In the night from Saturday to Sunday, a baker from Bompas (Pyrénées-Orientales), Mr. Sebelli saw, landed in a street of this village a cigar-shaped object about two feet long, surrounded by iridescent glow. Mr. Sebelli woke up neighbors who witnessed the fast departure of the craft. Elsewhere, three young hunters yesterday saw the moves above Gaillac (Aveyron), at high altitude, of a cigar-shaped object in the sky which followed a series of large "S". Each course was accompanied by a noise comparable to a jet of pressurized steam. The craft disappeared suddenly towards the North. Lastly, in Pont-de-Salars (Aveyron), a person saw in the sky, toward the Couhant, a disc surrounded by a wide luminous circle of an unsustainable shine. Slowly descended toward the horizon, the disc disappeared at breakneck speed. RIOM. -- During the last night, the police officers Roger Thévenin and Albert Daury, of the Riom urban squad, who were on patrol saw in the sky a cigar-shaped craft that was heading from South to North. Three balls of red fire detached and illuminated for a few moments a part of the sky. The cigar was of a metallic appearance, similar to duralumin. NANCY. -- During the night from Sunday to Monday, the residents of a farm located a few hundred meters from the village of Moncourt (the Meurthe-et-Moselle), have been excited by an abnormal whistling sound outside. Through the shutters, they distinguished a blinding light that seemed set on a hillside and disappeared soon after by rising vertically. This afternoon, the research undertaken towards the place indicated by the witnesses discovered on a dirt road, traces of intense burn. Samples of rock and dirt were taken to be submitted to experts. LA ROCHELLE. -- A colonial teacher currently on vacation in the Oléron Island, Mr. Martin, claims to have met two lovely Martian, measuring about 1 m. 70, booted, gloved and helmeted of leather. Both Martians seized Mr. Martin's pend and traced incomprehensible signs in his notebook while trying to make themselves understood. Mr. Martin reportedly carefully kept this manuscript. "In the night of Sunday to Monday, the inhabitants of a farm, located at a few hundreds of meters of the village of Moncourt (the Meurthe-et-Moselle), went into a commotion due to an abnormal outside whistling sound. Through the windows shutters, they distinguished a dazzling gleam which seemed fixed at a hillside and which disappeared shortly afterwards while rising vertically. This afternoon, the search undertaken in the direction of the location indicated by the witnesses allowed the discovery, on a dirt track, traces of intense calcination. Samples of stones and ground were taken to be submitted to experts. In the night of Sunday to Monday, the residents of a farm located at a few hundreds of meters of the village of Montcourt (Meurthe-et-Moselle) were put in agitation by an anomalous whistling sound outside. Through the shutters, they distinguished a dazzling gleam which appeared fixed at a hillside and which disappeared little after, rising vertically. The research undertaken in direction of the locations indicated by the witnesses allowed the discovery, on a dirt track, of traces of intense burn. Samples of stones and ground were taken to be submitted to experts. Oct. 11, 1954, 01:30, Doncourt-Village (France). Farmers awakened by a whistling sound saw a flat object land near the woods. It soon rose very fast, vertically, and flew away. The ground was found calcined. Samples were taken by police officials for analysis. (56) (Le Figaro, 13 oct 1954). The author indicates that on October 11, 1954, farmers close to Doncourt-Village in the Meurthe-et-Moselle were awaken by a strange whistle. They saw that a flat object had landed close to the forest. It soon rose very quickly, vertically, and flew away. The ground was found burnt. Samples were taken by officials for analysis. In the night, the inhabitants of an isolated farm located a few hundreds meters of the village were awaken by an abnormal whistling sound. Through their shutters, they distinguish a dazzling gleam, which seem to be motionless on a side of a hill. A few minutes later, they see a luminous ball rising vertically and disappearing quickly. On the next day's afternoon, police officers came to inquire on location and discovered at the alleged place of the landing of the intense traces of burn on the dirt track. The two authors indicate that sampling of stones and ground occurred, but that the result of the analysis was never made public. In his book about the famous UFO landing in Socorro, Ray Stanford indicates a number of other sightings of egg-shaped craft that may be significant in this regard. Among those cases, he indicates that on October 11, 1954, near Dancourt Village in the Meurthe-et-Moselle, France, farmers were aroused from sleep by a strange whistling noise, and they then they noticed that a flat object had landed close to the woods nearby. The object took off vertically at high speed. Officials found that the ground underneath was calcined. "In the night of Sunday to Monday, the inhabitants of a farm, located at a few hundreds of meters of the village of MONCOURT (the Meurthe-et-Moselle), went into a commotion due to an abnormal outside whistling sound. Through the windows shutters, they distinguished a dazzling gleam which SEEMED fixed at a hillside and which disappeared shortly afterwards while rising vertically. This afternoon, the search undertaken in the direction of the location indicated by the witnesses allowed the discovery, on a dirt track, traces of intense calcination. Samples of stones and ground were taken to be submitted to experts." They add that they contacted "the witnesses of this phenomenon" and that "globally, their account correspond with that of the press of the time." The authors indicate that in Montcourt, on October 11, 1954, at approximately 01:30, farmers living an isolated farm, at some hundreds meters from Montcourt, were awaked by an abnormal whistling sound. Through the shutters, they distinguished a dazzling gleam which seemed fixed at a hillside. The object soon rose vertically and very quickly and quickly disappeared. Research in the afternoon at the place indicated by the witnesses resulted in the discovery of traces of intense calcination on a dirt track. Samples of stones and earth were taken for analysis but no result came to the knowledge of the authors. The authors say that Vallée had indicated Doncourt as location but it is an error and that it is indeed Montcourt in the Moselle. The sources are indicated as case 230 of the Vallée catalogue; C. Garreau and R. Lavier in "Face aux ET" pages 215-216; and Le Figaro for 10/13/1954. Jean Sider indicates that in the night from the 10th to October 11th, 1954, in Doncourt, Mrs. Jacques, farmer in Doncourt, and Mr. Felix André, saw an object or a luminous phenomenon posed on the hill at the edge of the wood of Doncourt, emitting crackling and whistling noises while emitting a dazzling gleam. On the spot, traces of calcination on a diameter of 1.50 meters were found. The stones had become of brick-red color and the ground was reduced to ashes on a 3 centimeters thickness. Jean Sider indicates that the local source is the newspaper Le Lorrain, of Metz, for October 12, 1954, page 7, and an investigation by LDLN. He indicates elsewhere in his book that the counter-investigation by Barthel and Brucker on the case is "imaginary." In her chronology, Genevieve van Overmeire indicates that on October 11, 1954 in France, in Moncourt, and not in "Doncourt", in the Moselle, in the night the inhabitants of an isolated farm at a few hundreds meters from the village were awaked by an abnormal whistling sound. Through the shutters they distinguished a dazzling gleam fixed at a hillside. A few minutes later they saw a luminous ball rising vertically and disappearing quickly. There was a report by the gendarmerie. At 01.30 farmers were awaked by a whistling sound at Doncourt-Village, and saw a flat object landing close to the wood. Soon it rose very quickly vertically and flew away. The ground was calcined. The police force took samples. The source is noted "Jacques Vallée: "Chronique des apparitions ET" - DENOEL 1972 - COLL. J'AI LU - p. 275". Farmers awakened by a whistling sound saw a flat object land near the woods. It soon rose very fast, vertically, and flew away. The ground was found calcined. Samples were taken by police officials for analysis. Donald Johnson indicates that on October 11, 1954, farmers in Doncourt-Village, France were awakened by a whistling sound and saw a flat object land near the woods. It soon rose up vertically very fast, and flew away. The ground was found calcified. Soil samples were taken by the police for analysis. The source is indicated as Jacques Vallee, Passport to Magonia: A Century of Landings, p. 224. In the night from October the 10th to the 11th, 1954, inhabitants of an isolated farm, at a few hundreds of meters of Moncourt, were woken up by a strange whistling sound. Through the shutters, they distinguished a dazzling gleam which seemed located at a hillside. A few minutes later, they saw a luminous sphere rise vertically and disappear quickly. The next, in the afternoon, the gendarmes led by the farmer to the place where the strange light seemed to have landed, discovered traces of intense calcination on a dirt track. Sampling of stones and ground were carried out. As in the majority of the similar cases, the results of the analyses were never known. It should be specified that at that time the unexplained aerial phenomena were classified "TOP SECRET" because it was thought that they were secret weapons of foreign powers. Is this the same "craft" which was observed during three hours, the same night, above Metz? Sources "Lumières dans la Nuit"
Luc Chastan indicates that in the Meurthe et Moselle in Doncourt lès Longuyon, on October 10, 1954, a couple observed a luminous phenomenon posed on the slope at the edge of the wood of Doncourt during the night of the 10th to the 11th. It emitted noises of crackling and whistle while diffusing a dazzling light. In the morning the traces of calcination were observed on 1 m 50 of diameter at the place of the incident. Stones became brick-red and the ground is calcined on a 3 centimeters thickness. This trace was discovered by a third witness. The source is Lumières dans la Nuit #374. Jérôme Beau indicates that on Monday, October 11, 1954, at 01:30 at Doncourt-Village in France, "farmers were awakd [sic] by a wistle [sic], saw a flat object to land nea [sic] the woods: soon it rose very quickly, vertically, and flew away. The ground was calcined. Samples were taken by the police force for analysis." The source is indicated as "Le Figaro, October 13, 1954". The author indicates that on October 10, 1954, in Montcourt between Metz and Nancy, inhabitants of a farm isolated at some hundred meters from Montcourt were awaked by a strange whistling sound. Through the shutters, they distinguished a dazzling gleam which seemed located at a hillside, and a few minutes later they saw a luminous sphere rising vertically and disappearing quickly. The next day afternoon the gendarmes were led by the farmer on the landing site and discovered traces of intense calcination on a dirt track. Samples were taken, the results of the analyses were never known. The author indicates that on October 11, 1954, at Doncourt-village in France, farmers were awaked by a whistling sound and saw a flat object land close to the wood and soon rise vertically very quickly. The ground was burnt the police took samples for analysis. The website indicates that on 11 October 1954 at 01:30, in Doncourt-Village, France, farmers were awakened by a whistling sound and saw a flat object land near the woods. It was a hoax. It soon rose very fast, vertically, and flew away. The ground was found calcined. Samples were taken by police officials for analysis. An object was observed. Traces were found. "One ball was observed by two witnesses in a forest for a few seconds (Chaumeau)." The source is noted as "Vallee Magonia Database". Note: witness "Chaumeau" has nothing to do with this case. *Oct. 11, 1954 - At 1:30 a.m. farmers in Doncourt-Village, Meurthe-et-Moselle, France were awakened by a whistling sound and saw a flat object land near the woods. It soon rose up vertically very fast, and flew away. The ground was found calcified. Soil samples were taken by the police for analysis. (Sources: Figaro, October 13, 1954; Jacques Vallee, Passport to Magonia: A Century of Landings, p. 224, case # 230). Spheres, luminous cones or cigars, discharging of batteries, dancing colors, etc., between the 1st and the 21st of October 1954, some twenty testimonies and observations of UFOs (Unidentified Flying Objects) were collected in the Moselle, the more particularly in the communes of Vergaville, Bidestroff, Kerprich, Guébling, Morsbach, Moncourt, Saint-Avold, Saint-Quirin and Jouy-aux-Arches. In Pournoy-la-Chétive, near Metz, two children declared that they had seen an alien with a hairy face come down from his flying saucer to come and speak to them in an incomprehensible language. Members of a farming family were awakened by a strange whistling sound, and looking through the open shutters they saw a flat luminous object, three times the apparent size of the sun, which appeared to land on a hillside, then take off again a few moments later. At the site a calcinated circle 1.5m diameter was found. The earth was reduced to ashes to a depth of 3cm. The witnesses are the inhabitants of an isolated farm at a few hundreds meters from the village. They observed the phenomenon through the shutters in the form of a blinding light, fixed at hillside. A few minutes later they see a luminous ball rising vertically and quickly disappearing. The investigation and a report were carried out by the Gendarmerie, as usual, and not by the police. Lorraine is certainly the correct region since the first newspaper article on this sighting is published in Le Républicain Lorrain. Doncourt, a destroyed village near Craincourt, in Meurthe-et-Moselle. Doncourt, a destroyed village near Landécourt, in Meurthe-et-Moselle. Doncourt aux Templiers, 550163, South-East of Verdun, in Meuse. Doncourt-lès-Conflans, 540171, in the West of Metz, in Moselle until 1871, in Meurthe-et-Moselle. Doncourt-lès-Longuyon, 540172, in the South of Longwy, in Meurthe-et-Moselle. Doncourt-lès-Beuveille, puis Beuveille-Doncourt, 54620, East of Longuyon, in Moselle until 1871, in Meurthe-et-Moselle later, disappeared in 1936. Beuveille-Doncourt, in Meurthe-et-Moselle, disappeared in 1936. Moncourt, a destroyed village near Sauvigny, Meuse, where only a chapell now remains. Moncourt, 570473, 57810, 12 km South-East of Dieuze, in Meurthe until 1871, in Moselle. So, there are several "Doncourt" in the Meurthe-et-Moselle department. In Le Républicain Lorrain and L'Est Républicain, the place is indeed indicated as "Doncourt-Village". It is in Le Figaro, a national newspaper from Paris, that the place becomes "Moncourt (the Meurthe-et-Moselle)". As ufologist Jean Sider rightfully often pointed out, the local press has much more chance to spell correctly the names of local places and people than the national press in Paris. One might have thought that these two communes are close, but it is not so: they are distant of 36 kilometers in a straight line. 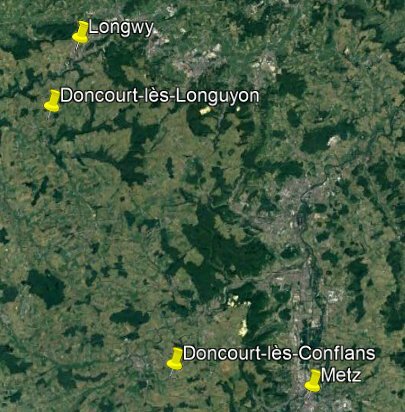 Doncourt-lès-Longuyon is very close to Longwy; which makes it the most likely place for the correspondant of the two newspapers write from Longwy, and that Dontcourt-lès-Conflans is close to Metz, far from a press correspondent in Longwy. In addition, at least in 2015, there is no wood in Dontcourt-lès-Conflans, there are small woods near Dontcourt-lès-Longuyon. Finally, at Dontcourt-lès-Longuyon, there is a wooded hill from the rue des Moissonneurs, another further away from a dirt road to the south, and another from a road going north. On the contrary, Doncourt-lès-Conflans is in an area that seems perfectly flat. Above: four possible approximate places in Dontcourt-lès-Longuyon. The one in the South is the only one to be on a dirt road, the others are at the end of normal roads - of course these roads were perhaps also dirt roads in 1954, and the roads and path may have changed since 1954. Note that the moon - full - was at 224° and a height not conductive to speak of a "landing" or proximity to the ground: 36°. To me, this seems to be a "good" case, the more so as "skeptical" ufologists Barthel and Brucker say they investigated, that the witnesses confirmed what appeared in the Press reports, and that they give no prosaic explanations; which they would surely have mentioned if they had found one. 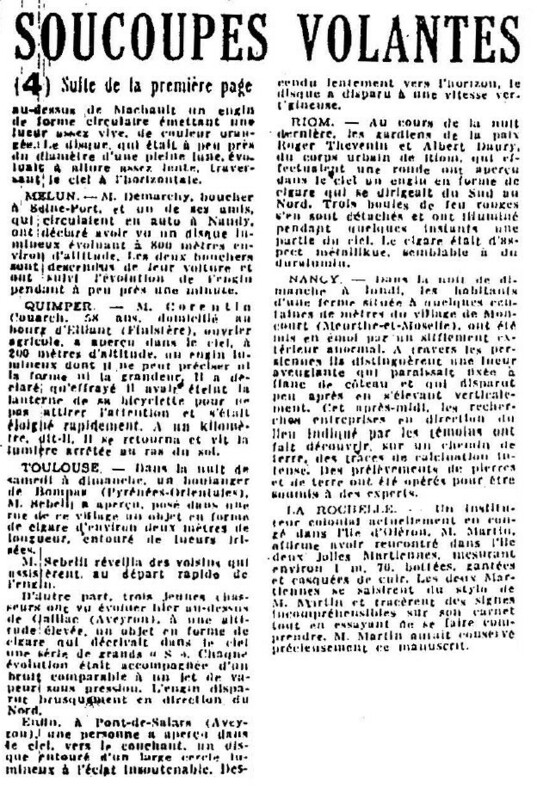 [er1] Article in the regional newspaper L'Est Républicain, Nancy, France, page 7, October 12, 1954. [rl1] Article in the regional newspaper Le Républicain Lorrain, Metz, France, page 7, October 12, 1954. [fs1] Article in the national newspaper France-Soir, Paris, France, October 12, 1954. [ha1] Article in the regional newspaper Le Havre, France, pages 1 and 4, October 13, 1954. [lf1] Article in the national newspaper Le Figaro, France, October 13, 1954. [qh1] Article in the regional newspaper Le Quotidien de la Haute-Loire, France, October 14, 1954. [jv1] "Chronique des Apparitions Extra-terrestres", French translation of "Passport to Magonia", book by Jacques Vallée, Denoel publisher, France, page 271, 1972. [jv2] Summary by Jacques Vallée in "The Humanoids: a survey of world-wide reports of landings of unconventional aerial objects and their alleged occupants", book by Charles Bowen, Neville Spearman publisher, 1969. [jv2] Summary by Jacques Vallée in "En Quête des Humanoïdes", book by Charles Bowen, French translation of "The Humanoids", J'ai Lu publisher, France, page 48, 1974. [gl1] "Face Aux Extra-Terrestres", book by Charles Garreau et Raymond Lavier, Delarge publisher, France, pp 223-224, 1975. [ld1] "en Moselle - Enquêtes de M. C. FRITZ", in the ufology magazine Lumières Dans LA Nuit (LDLN) France, #140, page 25, December 1974. [rs1] "Socorro Saucer - The Closest Encounter of Them All", book by Ray Stanford, Blueapple Books publisher, USA, 1976. [rs1] "Socorro Saucer - The Closest Encounter of Them All", book by Ray Stanford, Fontana-Collins publisher, U-K., page 146, 1978. [bb1] "La Grande Peur Martienne", book by Gerard Barthel and Jacques Brucker, Les Nouvelles Editions Rationalistes publisher, France, page 125, 1979. [fr1] "OVNI, Premier Dossier Complet des Rencontres Rapprochées en France", book by Michel Figuet and Jean Louis Ruchon, Alain Lefeuvre publisher, France, page 146, 1979. [mf3] "ATTERRISSAGES D'UFO sur le continent français du 26 septembre 1954 au 18 octobre 1954", list compiled by Michel Figuet, in the ufology magazine Lumières Dans La Nuit (LDLN), France, #249-250, page 26, March / April 1985. [mf1] "Catalogue Francat des rencontres rapprochées en France (Listing 800 1982) (2 - Suite)", list compiled by Michel Figuet, in the ufology magazine Lumières Dans La Nuit (LDLN), France, #257-258, page 18, November - December 1985. [js1] "Le Dossier 1954 et l'Imposture Rationaliste", book by Jean Sider, Ramuel publisher, France, pages 19,251, 1997. [dj1] "Encounters With Aliens On This Day - October 11", compiled by Donald A. Johnson, USA, circa 2005, at www.ufoinfo.com/onthisday/October11.html. [ol1] "Les Observations d'ovnis en Lorraine", ("UFO sightings in the Lorraine"), disappeared web page, circa 2003. [---] Ufology magazine Lumières dans la Nuit (LDLN), France, #374, 2004. [mp1] "Générations UFO", book by Michel Padrines, self-published, France, page 122, December 2006. [mp2] "Générations UFO", book by Michel Padrines, self-published, France, page 123, December 2006. 0.1 Patrick Gross November 17, 2004 First published. 1.0 Patrick Gross December 20, 2008 Conversion from HTML to XHTML Strict. First formal version. Additions [fr1], [go1], [js1], [dj1], [lc1], [jb1], [mp1], [mp2], [ud1]. 1.1 Patrick Gross June 28, 2010 Addition [jv5]. 1.2 Patrick Gross September 21, 2014 Additions [ha1], [ni1]. 1.3 Patrick Gross November 20, 2016 Additions [rt1], [ub1]. 1.4 Patrick Gross January 4, 2017 Addition [fs1]. 1.5 Patrick Gross February 11, 2017 Addition [bl1]. 1.7 Patrick Gross April 22, 2019 Additions [ld1], [mf3], [mf1], [lh1], [pr2], Summary. In the Explanations, addition of the part "Doncourt-lès-Conflans or Doncourt-lès-Longuyon?" This page was last updated on April 22, 2019.